The Block of the month projects below are mostly ones I have made for use at our monthly quilting group. When I first started as BOM coordinator I searched the web for ideas (Glendale Quilting Guild, Fallbrook Quilt Guild, Patch Pieces and friends). Some of the original projects I used can still be found here. 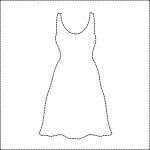 Once I was up and running with the quilting software EQ7 I began creating my own BOM projects and patterns. Usually a single block is offered to the group for each person to complete over the next month. All those who have contributed a block go in the draw to win all the blocks that were made using the BOM. A great way to learn and practice varying techniques and also a great way of acquiring a quilt! 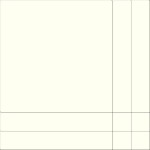 The following pages contain Block of the Month projects that you can use for your quilting group. Some are appliqué, while others are patchwork. Feel free to use any of the following blocks as you choose. 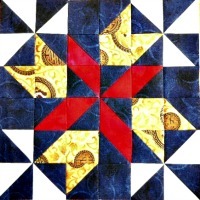 An intriguing Seeing Stars block that is a paper pieced block suitable for all skill levels of quilter. 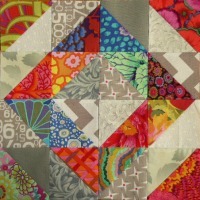 A stunning Four Winds block that creates a secondary design when made into a quilt. 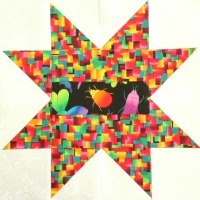 A bright bug I spy Star block to make into a quilt and delight any very young child. Made entirely from your scraps this depression block is constructed from half square triangles in light and dark fabrics. A simple bento box block made from 4 identical blocks with colors reversed in two of them. It's name comes from the Japanese food boxes. 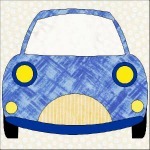 A stunning wee car block to delight any wee boy when made into a quilt. There's nothing more summery than eating an ice cream. This ice cream treats is fun to complete and can be decorated in many exciting ways. 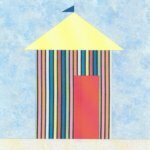 There are many variations you can use when making this beach house block. 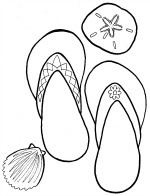 Summer is also a time for wearing your jandals at the beach. 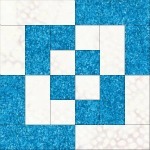 Enjoy creating this summer jandals block . Set on a beach colored background makes it look very summery. If you love going to the races then my dress block will give you a lot of pleasure. 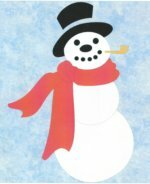 This snowman block offers continuity with the interest coming through the scarves and added embellishments. Easter blocks are fun to make for children. 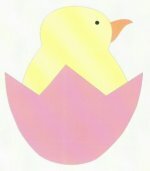 This Easter Chick block when made would look great alternating with an Easter Egg Block. Another cute Easter block is Easter Bunny Basket. Christmas blocks always look festive when made. Try this Christmas ornament block. It's made using four colors. 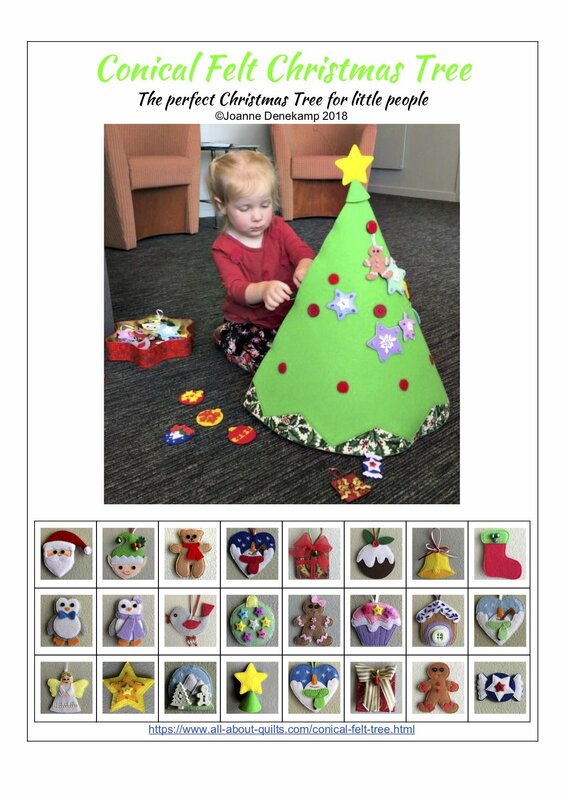 Another popular Christmas block is the Christmas tree block. A great block to use up those leftover Christmas fabrics. 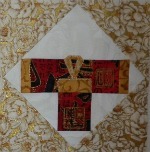 The Christmas Cracker pieced block is made using red, greens, gold or silver fabrics. 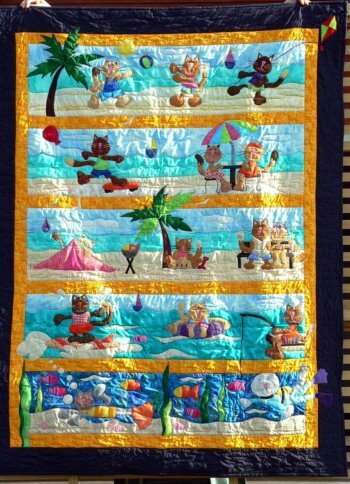 There seems to be endless ideas for quilts for children. I once saw a fabulous quilt using a jar theme so thought it appropriate to have one in my block of the month set. The jar block is very versatile. Bugs for boys, pinks for girls or even food for the teenager! Another colorful block is the I spy block. You will use a lot of different colorful prints to make the beach ball block . 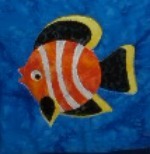 The clown fish block is made using batiks. You will notice a definite resemblance to Nemo if you choose red and white fabrics. 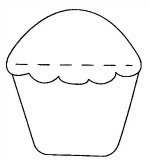 Tea for two is always fun and this cupcake block makes the most delicious cupcakes ever! The nautical block looks very fresh in blues. Embellishing this block makes all the difference. 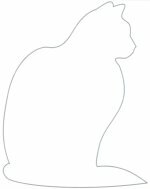 This next block is made using four different cat templates. By making multiple blocks you can make a fabulous Cat Block. The Irish chain block uses only 2 tone on tone colors, green and white. A great block for St Patrick's day. Friendship star is a lovely block, based on the nine patch, that can be made in any colorway you choose. 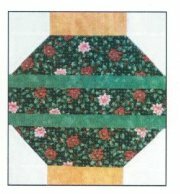 If you are wanting to make an Amish block try the turnstile block , it uses only two colors. The kimono block is a real treat. 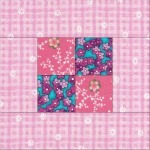 There are so many lovely Asian fabrics with gold overlay that would suit this block. Also being able to create both back & front views makes it more fun. 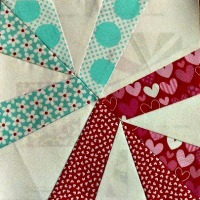 The next block is called Bright Hope, and is a great one to make for someone in need of encouragement. It is made from tone on tone reds. If you are looking for a block that uses a large novelty print then the Window Block might be just what you are looking for. Scrappy Quilt is an easy quilt block to make and also has the advantage of being a great one for using up some of those scraps! valentines day block are blocks that both use reds. There is another form of BOM where you make the whole quilt yourself, receiving a monthly addition to making the quilt. There's no better way to tackle a more challenging project than with a block of the month quilt pattern. 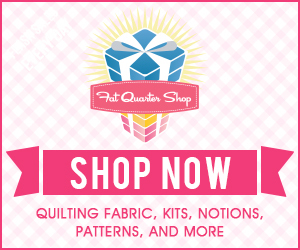 Progressing through the patterns each month enables you to accomplish beautiful quilts with ease. 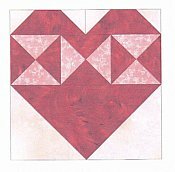 These monthly quilt patterns offer a simplified and manageable approach to larger patchwork and quilting projects. 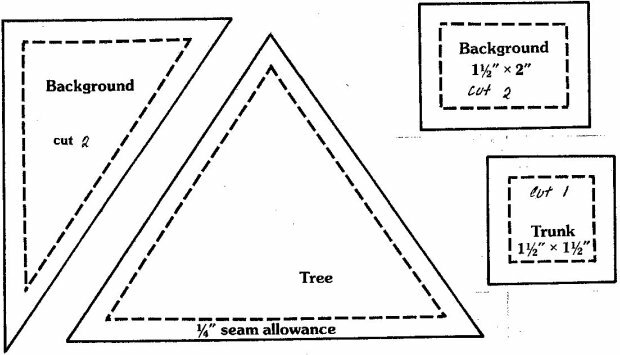 BOM quilt patterns help to ease the uncertainty of knowing where to start. They give you the confidence that you need to complete the project. Tackling a quilt in sections or blocks enables you to progress quickly and easily through even the most challenging quilt. Each month you will be amazed and delighted as your quilt takes shape right before you eyes. 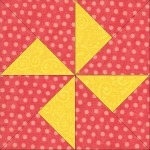 Many quilting shops have a range of BOM projects for purchase. These are often sent out to you on a monthly basis with payment as you go, making that another benefit when using BOM projects. Below is the first BOM project I participated in. This is a project I completed in just over a year. I purchased it through Cushla's Village Fabrics. I have shown their listing below. Finished size: 54"x78"Available now or as a kitset.This is an exciting new block of the month which would be great for any child's room or holiday place. 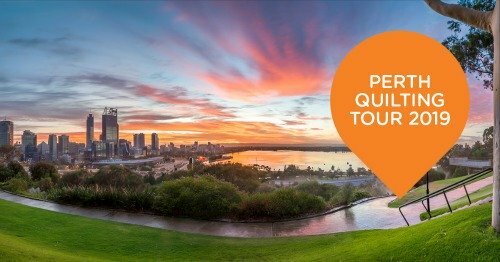 Purrfect Day Out is an 10-month programme at $37.50 per month plus postage. You will receive each row over two postings. Borders charged separately.